The Edinburgh Marathon Festival is now in its 16th year and takes place on Saturday 26th and Sunday 27th May 2018. This ever-growing festival of running is now a major event in the Scottish sporting calendar. Starting in Edinburgh, the course heads out through East Lothian offering stunning views and an unforgettable running experience. 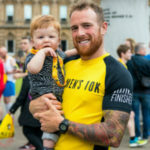 The Men’s 10K aims to provide a stage for men from all walks of life to come together and take control of their health. Whether you’re running to lose weight, quit smoking or fundraise for charitable causes, we salute each and every guy that gets out there and makes a positive change. The SUBWAY Helping Hearts™ Family 5K series is bouncing back to Edinburgh for 2017! With lots of free and fun entertainment including face-painting, games and a bouncy castle, it’s the perfect day out for the whole family to enjoy! The SUBWAY Helping Hearts™ Family 5K series is bouncing back to Glasgow for 2017! With lots of free and fun entertainment including face-painting, games and a bouncy castle, it’s the perfect day out for the whole family to enjoy! Kilomathon Scotland takes place in Edinburgh and is run on the beautiful Edinburgh cycle path network. Runners take in the historic Royal Yacht Britannia, picturesque Victoria Park and enjoy tranquil cycle paths before a fantastic finish in front of the West Stand at BT Murrayfield Stadium. The SUBWAY Helping Hearts™ Family 5K series is bouncing back to Holyrood Park for 2016! With lots of free and fun entertainment including face-painting, games and a bouncy castle, it’s the perfect day out for the whole family to enjoy! The SUBWAY Helping Hearts™ Family 5K series is bouncing back to Strathclyde Park for 2016! With lots of free and fun entertainment including face-painting, games and a bouncy castle, it’s the perfect day out for the whole family to enjoy! There are no stopwatches or timers involved in The Color Run Presented by Skittles, meaning participants can walk, jog, dance and party their way along the course at any pace. Starting in a white t-shirt and reaching different colour zones at each kilometre, it’s impossible to finish the ‘Happiest 5K’ without being covered in colour!